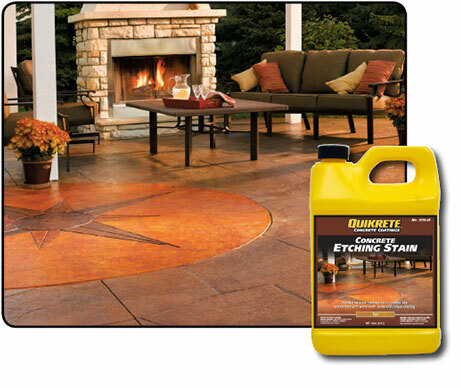 QUIKRETE® Concrete Etching Stains (No. 7215-25, -26, -28, -29) transform plain concrete into a marble-like appearance with warm Earth-Tones and unique shading. The acid-based stains react with the cement as they penetrate the surface, creating a permanent effect. Apply at 100-400 sq ft. per gallon (9.3-18.6 m2) coverage will depend on porosity of the surface.